The authors of this study start out by noting the obvious: that credit networks can both help institutions to pool resources to achieve things they couldn't on their own, and to diversify against the risks they face. At the same time, the linking together of institutions by contracts implies a greater chance for the propagation of financial stress from one place to another. The same thing applies to any network such as the electrical grid -- sharing demands among many generating stations makes for a more adaptive and efficient system, able to handle fluctuations in demand, yet also means that failures can spread across much of the network very quickly. New Orleans can be blacked out in a few seconds because a tree fell in Cleveland. ... in their pioneering contribution Allen and Gale reach the conclusion that if the credit network of the interbank market is a credit chain – in which each agent is linked only to one neighbor along a ring – the probability of a collapse of each and every agent (a bankruptcy avalanche) in case a node is hit by a shock is equal to one. As the number of partners of each agent increases, i.e. as the network evolves toward completeness, the risk of a collapse of the agent hit by the shock goes asymptotically to zero, thanks to risk sharing. The larger the pool of connected neighbors whom the agent can share the shock with, the smaller the risk of a collapse of the agent and therefore of the network, i.e. the higher network resilience. Systemic risk is at a minimum when the credit network is complete, i.e. when agents fully diversify individual risks. In other words, there is a monotonically decreasing relationship between the probability of individual failure/systemic risk and the degree of connectivity of the credit network. This is essentially the positive story of risk sharing which is taken as the norm in much thinking about risk management. More sharing is better; the probability of individual failure always decreases as the density of risk-sharing links grows. The larger the number of connected neighbors, the smaller the risk of an individual collapse but the higher systemic risk may be and therefore the lower network resilience. In other words, in our paper, the relationship between connectivity and systemic risk is not monotonically decreasing as in Allen and Gale, but hump shaped, i.e. decreasing for relatively low degree of connectivity and increasing afterwards. Note that they are making a distinction between two kinds of risk: 1. individual risk, arising from factors specific to one bank's business and which can make it go bankrupt, and 2. systemic risk, arising from the propagation of financial distress through the system. As in Allen and Gale, they find that individual risk DOES decrease with increasing connectivity: banks become more resistant to shocks coming from their own business, but that systemic risk DOES NOT decrease. The latter risk increases with higher connectivity, and can win out in determining the overall chance a bank might go bankrupt. In effect, the effort on the part of many banks to manage their own risks can end up creating a new systemic risk that is worse than the risk they have reduced through risk sharing. There are two principle elements in the credit network model they study. First is the obvious fact that resilience of an institution in such a network depends on the resilience of those with whom it shares risks. Buying CDS against the potential default of your Greek bonds is all well and good as long as the bank from whom you purchased the CDS remains solvent. In the 2008 crisis, Goldman Sachs and other banks had purchased CDS from A.I.G. to cover their exposure to securitized mortgages, but those CDS would have been more or less without value had the US government not stepped in to bail out A.I.G. ... trend reinforcement is also quite a general mechanism in credit networks. It can occur in at least two situations. In the first one (see e.g. in (Morris and Shin, 2008)), consider an agent A that is hit by a shock due a loss in value of some securities among her assets. If such shock is large enough, so that some of A’s creditors claim their funds back, A is forced to fire-sell some of the securities in order to pay the debt. If the securities are sold below the market price, the asset side of the balance sheet is decreasing more than the liability side and the leverage of A is unintentionally increased. This situation can lead to a spiral of losses and decreasing robustness (Brunnermeier, 2008; Brunnermeier and Pederson, 2009). A second situation is the one in which when the agent A is hit by a shock, her creditor B makes condition to credit harder in the next period. Indeed it is well documented that lenders ask a higher external finance premium when the borrowers’ financial conditions worsen (Bernanke et al., 1999). This can be seen as a cost from the point of view of A and thus as an additional shock hitting A in the next period. In both situations, a decrease in robustness at period t increases the chance of a decrease in robustness at period t + 1. It is the interplay of such positive feedback with the propagation of distress in a dense network which causes the overall increase in systemic risk at high connectivity. I'm not going to wade into the detailed mathematics. Roughly speaking, the authors develop some stochastic equations to follow the evolution of a bank's "robustness" R -- considered to be a number between 0 and 1, with 1 being fully robust. A bankruptcy event is marked by R passing through 0. This is a standard approach in the finance literature on modeling corporate bankruptcies. The equations they derive incorporate their assumptions about the positive influences of risk sharing and the negative influences of distress propagation and trend reinforcement. The key result shows up clearly in the figure (below), which shows the overall probability of a bank in the network to go bankrupt (a probability per unit of time) versus the amount of risk-sharing connectivity in the network (here given by k, the number of partners with which each bank shares risks). 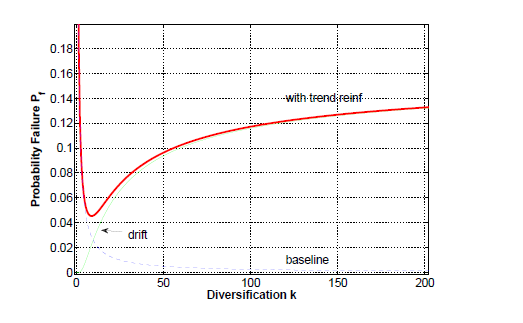 It may not be easy to see, but the figure shows a dashed line (labeled 'baseline') which reflects the classical result on risk sharing in the absence of trend reinforcement. More connectivity is always good. 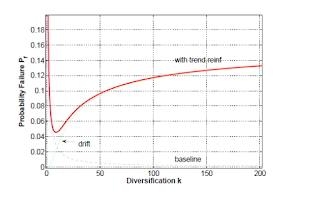 But the red curve shows the more realistic result with trend reinforcement or the positive feedback associated with financial distress taken into account. Now adding connectivity is only good for a while, and eventually becomes positively harmful. There's a middle range of optimal connectivity beyond which more connections only serve to put bank in greater danger. In a broader perspective, this conceptual framework may have far reaching implications also for the assessment of the costs and benefits of globalization. Since some credit relations involve agents located in different countries, national credit networks are connected in a world wide web of credit relationships. The increasing interlinkage of credit networks – one of the main features of globalization – allows for international risk sharing but it also makes room for the propagation of financial distress across borders. The recent, and still ongoing, financial crisis is a case in point. International risk sharing may prevail in the early stage of globalization, i.e. when connectivity is relatively ”low”. An increase in connectivity at this stage therefore may be beneficial. On the other hand, if connectivity is already high, i.e. in the mature stage of globalization, an increase in connectivity may bring to the fore the internationalization of financial distress. An increase in connectivity, in other words, may increase the likelihood of financial crises worldwide. Which is, in part, why we're not yet out of the European debt crisis woods. But also have a look at the web site of the project behind the study, the European project Forecasting Financial Crises, where the authors have tried to clear up several common misinterpretations of just what the study shows. Indeed, I know the members of this group quite well. They're great scientists and this is a beautiful piece of work. If you know a little about natural complex networks, then the structures found here actually aren't terrifically surprising. However, they are interesting, and it's very important to have the structure documented in detail. Moreover, just because the structure observed here is very common in real world complex networks doesn't mean its something that is good for society. I should have known this, but didn't -- the Federal Reserve Banks are not United States Government institutions. They are indeed owned by the private banks themselves, even though the Fed has control over taxpayer funds.This seems dubious in the extreme to me, although I'm sure there are many arguments to consider. Memory recalls reading arguments about the required independence of the central bank, but independence is of course not the same as "control by the private banks." Maybe we need to change the governance of the Fed and install some oversight with real power from a non-banking non-governmental element. FBI head J. Edgar Hoover, 1955. In recent years, the attraction has been very strong indeed. This is why knowing history is so important. Many battles have been fought before. FREE MONEY. Ordinary people have to borrow their money at market rates. Lloyd Blankfein and Jamie Dimon get billions of dollars for free, from the Federal Reserve. They borrow at zero and lend the same money back to the government at two or three percent, a valuable public service otherwise known as "standing in the middle and taking a gigantic cut when the government decides to lend money to itself." I have little time to post this week as I have to meet several writing deadlines, but I wanted to briefly mention this wonderful and extremely insightful speech by Adair Turner from last year (there's a link to the video of the speech here). Turner offers so many valuable perspectives that the speech is worth reading and re-reading; here are a few short highlights that caught my attention. .. why, we might ask, do we need new economic thinking when old economic thinking has been so varied and fertile? ... Well, we need it because the fact remains that while academic economics included many strains, in the translation of ideas into ideology, and ideology into policy and business practice, it was one oversimplified strain which dominated in the pre-crisis years. For over half a century the dominant strain of academic economics has been concerned with exploring, through complex mathematics, how economically rational human beings interact in markets. And the conclusions reached have appeared optimistic, indeed at times panglossian. Kenneth Arrow and Gerard Debreu illustrated that a competitive market economy with a fully complete set of markets was Pareto efficient. New classical macroeconomists such as Robert Lucas illustrated that if human beings are not only rational in their preferences and choices but also in their expectations, then the macro economy will have a strong tendency towards equilibrium, with sustained involuntary unemployment a non-problem. And tests of the efficient market hypothesis appeared to illustrate that liquid financial markets are not driven by the patterns of chartist fantasy, but by the efficient processing of all available information, making the actual price of a security a good estimate of its intrinsic value. · Macroeconomic policy – fiscal and monetary – was best left to simple, constant and clearly communicated rules, with no role for discretionary stabilisation. · Deregulation was in general beneficial because it completed more markets and created better incentives. · Financial innovation was beneficial because it completed more markets, and speculative trading was beneficial because it ensured efficient price discovery, offsetting any temporary divergences from rational equilibrium values. · And complex and active financial markets, and increased financial intensity, not only improved efficiency but also system stability, since rationally self-interested agents would disperse risk into the hands of those best placed to absorb and manage it. Turner goes on to argue that the more nuanced views of markets as very fallible systems didn't have much influence mostly because of ideology and, in short, power interests on the part of Wall St., corporations and others benefiting from deregulation and similar policies. I think it is also fair to say that economists as a whole haven't done a very good job of shouting loudly that markets cannot be trusted to know best or that they will only give good outcomes in a restricted set of circumstances.Why haven't there been 10 or so books by prominent economists with titles like "markets are often over-rated"? ...one of the key messages we need to get across is that while good economics can help address specific problems and avoid specific risks, and can help us think through appropriate responses to continually changing problems, good economics is never going to provide the apparently certain, simple and complete answers which the pre-crisis conventional wisdom appeared to. But that message is itself valuable, because it will guard against the danger that in the future, as in the recent past, we sweep aside common sense worries about emerging risks with assurances that a theory proves that everything is OK.
That is indeed a very important message. economic thinking which goes back to basics and which recognises the importance of specific evolved institutional structures (such as fractional reserve banking), rather than treating existing institutional structures either as neutral pass-throughs in economic models or as facts of life which cannot be changed. My question is - what happens if the Euro does collapse? Do European nations have well-planned emergency measures to restore the Franc, Deutchmark, Lira and other European currencies quickly? Somehow I'm not feeling reassured. This is no joke. Studies show that if you examine the genetic material of your typical banker, you'll find that only about 10% of it takes human form. The other 90% is much more slimy and has been proven to be of bacterial origin. That's 9 genes out of 10: bankers are mostly bacteria. Especially Lloyd Blankfein. This is all based on detailed state-of-the-art genetic science, as you can read in this new article in Nature. OK, I am of course joking. The science shows that we're all like this, not only the bankers. Still, the title of this post is not false. It just leaves something out. Probably not unlike the sales documentation or presentations greasing the wheels of the infamous Goldman Sachs Abacus deals. “How can one firm of relatively small global significance merit a government bailout? How can a single investment bank on Wall Street bring the world to the brink of financial collapse? How can a single insurance company require billions of dollars of public funds to stay solvent and yet continue to operate as a private institution? How can a relatively small country such as Greece hold Europe financially hostage? These are the questions for which I have found no satisfactory answers. That’s because there are none. It is not acceptable to say that these events occurred because they involved systemically important financial institutions. Take a look at this on the transparency of the Federal Reserve (from Financeaddict) compared to other large nations' central banks. Then watch this, where Timothy Geithner tries very hard to slip sleazily away from any mention of the $13 Billion that went directly from AIG to politically well-connected Goldman Sachs. "Did you have conversations with the AIG counterparties?" Response -- waffle, evade, waffle, stare, mumble. After that, try to tell me that the US is not neck deep in serious political corruption. And they wonder what Occupy Wall Street is all about! I don't see any mention of what might be called "trading" news, e.g. a large institutional investor or hedge fund reducing significantly its position in a given stock for reasons unrelated to the stock itself - or at least not synchronized with actual news on the underlying. The move can be linked to internal policy, or just a long-term call on the company which timing has little to do with market news, or lags them quite a bit (like an accumulation of bad news leading to a lagged reaction, for instance). These shocks are frequent even on fairly large cap stocks. They also tend to have lingering effect because the exact size of the move is never disclosed by the investor and can spread over long periods of time (i.e. days), which would explain the smaller beta. Yet this would be a case of "quantum correction", both in terms of timing and agent size, rather than a breakdown of the information hypothesis. Seconding the previous comment, asset price information comes in a lot more forms than simply "news stories about company X." All market actions contains information. Every time a trade occurs there's some finite probability that it's the action of an informed trader. Every time the S&P moves its a piece of information on single stock with non-zero beta. Every time the price of related companies changes it contains new information. Both of these comments note the possibility that every single trade taking place in the market (or at least many of them) may be revealing some fragment of private information on the part of whoever makes the trade. 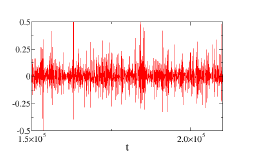 In principle, it might be such private information hitting the market which causes large movements (the s-jumps described in the work of Joulin and colleagues). I think there are several things to note in this regard. The first is that, while this is a sensible and plausible idea, it shouldn't be stretched too far. Obviously, if you simply assume that all trades carry information about fundamentals, then the EMH -- interpreted in the sense that "prices move in response to new information about fundamentals" -- essentially becomes true by definition. After all, everyone agrees that trading drives markets. If all trading is assumed to reveal information, then we've simple assumed the truth of the EMH. It's a tautology. More useful is to treat the idea as a hypothesis requiring further examination. Certainly some trades do reveal private information, as when a hedge fund suddenly buys X and sells Y, reflecting a belief based on research that Y is temporarily overvalued relative to X. Equally, some trades (as mentioned in the first comment) may reveal no information, simply being carried out for reasons having nothing to do with the value of the underlying stock. As there's no independent way -- that I know of -- to determine if a trade reveals new information or not, we're stuck with a hypothesis we cannot test. But some research has tried to examine the matter from another angle. Again, consider large price movements -- those in the fat-tailed end of the return distribution. One proposed idea looking to private information as a cause proposes that large price movements are caused primarily by large-volume trades by big players such as hedge funds, mutual funds and the like. Some such trades might reveal new information, and some might not, but let's assume for now that most do. In a paper in Nature in 2003, Xavier Gabaix and colleagues argued that you can explain the precise form of the power law tail for the distribution of market returns -- it has an exponent very close to 3 -- from data showing that the size distribution of mutual funds follows a similar power law with an exponent of 1.05. A key assumption in their analysis is that the price impact Δp generated by a trade of volume V is roughly equal to Δp = kV1/2. But more recent research (here and here, for example) suggest that this explanation doesn't quite hang together because the assumed relationship between large returns and large volume trades isn't correct. This analysis is fairly technical, but is based on the study of minute-by-minute NASDAQ trading and shows that, if you consider only extreme returns or extreme volumes, there is no general correlation between returns and volumes. The correlation assumed in the earlier study may be roughly correct on average, but it not true for extreme events. "Large jumps," the authors conclude, "are not induced by large trading volumes." Indeed, as the authors of these latter studies point out, people who have valuable private information don't want it to be revealed immediately in one large lump because of the adverse market impact this entails (forcing prices to move against them). A well-known paper by Albert Kyle from 1985 showed how an informed trader with valuable private information, trading optimally, can hide his or her trading in the background of noisy, uninformed trading, supposing it exists. That may be rather too much to believe in practice, but large trades do routinely get broken up and executed as many small trades precisely to minimize impact. All in all, then, it seems we're left with the conclusion that public or private news does account for some large price movements, but cannot plausibly account for all of them. There are other factors. The important thing, again, is to consider what this means for the most meaningful sense of the EMH, which I take to be the view that market prices reflect fundamental values fairly accurately (because they have absorbed all relevant information and processed it correctly). The evidence suggests that prices often move quite dramatically on the basis of no new information, and that prices may be driven as a result quite far from fundamental values. So what is left to explain the seemingly spontaneous large price jumps? We believe that the explanation comes from the fact that markets, even when they are ‘liquid’, operate in a regime of vanishing liquidity, and therefore are in a self-organized critical state . On electronic markets, the total volume available in the order book is, at any instant of time, a tiny fraction of the stock capitalisation, say 10−5 −10−4 (see e.g. ). Liquidity providers take the risk of being “picked off”, i.e. selling just before a big upwards move or vice versa, and therefore place limit orders quite cautiously, and tend to cancel these orders as soon as uncertainty signals appear. Such signals may simply be due to natural fluctuations in the order flow, which may lead, in some cases, to a catastrophic decay in liquidity, and therefore price jumps. There is indeed evidence that large price jumps are due to local liquidity dry outs. I promise very soon to stop beating on the dead carcass of the efficient markets hypothesis (EMH). It's a generally discredited and ill-defined idea which has done a great deal, in my opinion, to prevent clear thinking in finance. But I happened recently on a defense of the EMH by a prominent finance theorist that is simply a wonder to behold -- its logic a true empirical testament to the powers of human rationalization. It also illustrates the borderline Orwellian techniques to which diehard EMH-ers will resort to cling to their favourite idea. Rubinstein here is at least being very honest. He's going to jump through intellectual hoops to preserve his prior belief that people are rational, even though (as he readily admits elsewhere in the text) we know that people are not rational. Hence, he's going to approach reality by assuming something that is definitely not true and seeing what its consequences are. Only if all his effort and imagination fails to come up with a suitable scheme will he actually consider paying attention to the messy details of real human behaviour. Many of these errors in human reasoning are no doubt systematic across individuals and time, just as behavioralists argue. But, for many reasons, as I shall argue, they are unlikely to aggregate up to affect market prices. It is too soon to fall back to what should be the last line of defense, market irrationality, to explain asset prices. With patience, the anomalies that appear puzzling today will either be shown to be empirical illusions or explained by further model generalization in the context of rationality. Now, there's sense in the idea that, for various reasons, individual behavioural patterns might not be reflected at the aggregate level. Rubinstein's further arguments on this point aren't very convincing, but at least it's a fair argument. What I find more remarkable is the a priori decision that an explanation based on rational behaviour is taken to be inherently superior to any other kind of explanation, even though we know that people are not empirically rational. Surely an explanation based on a realistic view of human behaviour is more convincing and more likely to be correct than one based on unrealistic assumptions (Milton Friedman's fantasies notwithstanding). Even if you could somehow show that market outcomes are what you would expect if people acted as if they were rational (a dubious proposition), I fail to see why that would be superior to an explanation which assumes that people act as if they were real human beings with realistic behavioural quirks, which they are. But that's not how Rubinstein sees it. Explanations based on a commitment to taking real human behaviour into account, in his view, have "too much of a flavor of being concocted to explain ex-post observations – much like the medievalists used to suppose there were a different angel providing the motive power for each planet." The people making a commitment to realism in their theories, in other words, are like the medievalists adding epicycles to epicycles. The comparison would seem more plausibly applied to Rubinstein's own rational approach. The securities market is not the only example for which the aggregation of information across different individuals leads to the truth. At 3:15 p.m. on May 27, 1968, the submarine USS Scorpion was officially declared missing with all 99 men aboard. She was somewhere within a 20-mile-wide circle in the Atlantic, far below implosion depth. Five months later, after extensive search efforts, her location within that circle was still undetermined. John Craven, the Navy’s top deep-water scientist, had all but given up. As a last gasp, he asked a group of submarine and salvage experts to bet on the probabilities of different scenarios that could have occurred. Averaging their responses, he pinpointed the exact location (within 220 yards) where the missing sub was found. Now I don't doubt the veracity of this account or that crowds, when people make decisions independently and have no biases in their decisions, can be a source of wisdom. But it's hardly fair to cite one example where the wisdom of the crowd worked out, without acknowledging the at least equally numerous examples where crowd behaviour leads to very poor outcomes. It's highly ironic that Rubinstein wrote this paper just as the dot.com bubble was collapsing. How could the rational markets have made such mistaken valuations of Internet companies? It's clear that many people judge values at least in part by looking to see how others were valuing them, and when that happens you can forget the wisdom of the crowds. Obviously I can't fault Rubinstein for not citing these experiments from earlier this year which illustrate just how fragile the conditions are under which crowds make collectively wise decisions, but such experiments only document more carefully what has been obvious for decades. You can't appeal to the wisdom of crowds to proclaim the wisdom of markets without also acknowledging the frequent stupidity of crowds and hence the associated stupidity of markets. I will say markets are maximally rational if all investors are rational. Although most academic models in finance are based on this assumption, I don’t think financial economists really take it seriously. Indeed, they need only talk to their spouses or to their brokers. ... what is in contention is whether or not markets are simply rational, that is, asset prices are set as if all investors are rational. In these cases, I would like to say that although markets are not perfectly rational, they are at least minimally rational: although prices are not set as if all investors are rational, there are still no abnormal profit opportunities for the investors that are rational. This is the version of "rational markets" he then tries to defend throughout the paper. Note what has happened: the definition of the rational market has now been weakened to only say that markets move unpredictably and give no easy way to make a profit. This really has nothing whatsoever to do with the market being rational, and the definition would be improved if the word "rational" were removed entirely. But I suppose readers would wonder why he was bothering if he said "I'm going to defend the hypothesis that markets are very hard to predict and hard to beat" -- does anyone not believe that? Indeed, this idea of a "minimally rational" market is equally consistent with a "maximally irrational" market. If investors simply flipped coins to make their decisions, then there would also be no easy profit opportunities, as you'd have a truly random market. Why not just say "the markets are hard to predict" hypothesis? The reason, I suspect, is that this idea isn't very surprising and, more importantly, doesn't imply anything about markets being good or accurate or efficient. And that's really what EMH people want to conclude -- leave the markets alone because they are wonderful information processors and allocate resources efficiently. Trouble is, you can't conclude that just from the fact that markets are hard to beat. Trying to do so with various redefinitions of the hypothesis is like trying to prove that 2 = 1. Watching the effort, to quote physicist John Bell in another context, "...is like watching a snake trying to eat itself from the tail. It becomes embarrassing for the spectator long before it becomes painful for the snake." High frequency trading makes for markets that produce enormous volumes of data. Such data make it possible to test some of the old chestnuts of market theory -- the efficient markets hypothesis, in particular -- more carefully than ever before. Studies in the past few years show quite clearly, it seems to me, that the EMH is very seriously misleading and isn't really even a good first approximation. Let me give a little more detail. In a recent post I began a somewhat leisurely exploration of considerable evidence which contradicts the efficient markets idea. As the efficient markets hypothesis (the "weak" version, at least) claims, market prices fully reflect all publicly available information. When new information becomes available, prices respond. In the absence of new information, prices should remain more or less fixed. Striking evidence against this view comes from studies (now almost ten or twenty years old) showing that markets often make quite dramatic movements even in the absence of any news. I looked at some older studies along these lines in the last post, but stronger evidence comes from studies using electronic news feeds and high-frequency stock data. Are sudden jumps in prices in high frequency markets linked to the arrival of new information, as the EMH says? In a word -- no! The idea in these studies is to look for big price movements which, in a sense, "stand out" from what is typical, and then see if such movements might have been caused by some "news". A good example is this study by Armand Joulin and colleagues from 2008. Here's how they proceeded. Suppose R(t) is the minute by minute return for some stock. You might take the absolute value of these returns, average them over a couple hours and use this as a crude measure -- call it σ -- of the "typical size" of one-minute stock movements over this interval. An unusually big jump over any minute-long interval will be one for which the magnitude of R is much bigger than σ. This pattern reflects the well known "fat tailed" distribution of market returns, with large returns being much more likely than they would be if the statistics followed a Gaussian curve. Translating the numbers into daily events, s jumps of size s = 4 turn out to happen about 8 times each day, while larger jumps of s = 8 occur about once every day and one-half (this is true for each stock). Now the question is -- are these jumps linked to the announcement of some new information? To test this idea, Joulin and colleagues looked at various news feeds including feeds from Dow Jones and Reuters covering about 900 stocks. These can be automatically scanned for mention of any specific company, and then compared to price movements for that company. The first thing they found is that, on average, a new piece of news arrives for a company about once every 3 days. Given that a stock on average experiences one jump every day and one-half, this immediately implies an imbalance between the number of stock movements and the number of news items. There's not enough news to cause the jumps observed. Stocks move -- indeed, jump -- too frequently. Conclusion: News sometimes but not always causes market movements, and significant market movements are sometimes but not always caused by news. The EMH is wrong, unless you want to make further excuses that there could have been news that caused the movement, and we just don't recognize it or haven't yet figured out what it is. But that seems like simply positing the existence of further epicycles. 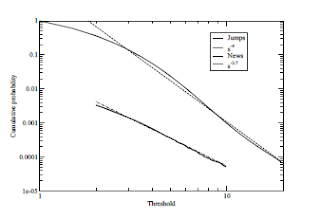 In both cases, we find (Figure 5) that the relaxation of the excess-volatility follows a power-law in time σ(t) − σ(∞) ∝ t− β (see also [22, 23]). The exponent of the decay is, however, markedly different in the two cases: for news jumps, we find β ≈ 1, whereas for endogenous jumps one has β ≈ 1/2. Our results are compatible with those of , who find β ≈ 0.35. 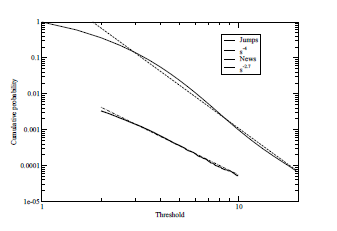 Of course, β ≈ 1/2 implies a much slower relaxation back to the norm (whatever that is!) than does β ≈ 1. Hence, it seems that the market takes a longer time to get back to normal after a no-news jump, whereas it goes back to normal quite quickly after a news-related jump. No one knows why this should be, but Joulin and colleagues made the quite sensible speculation that a jump clearly related to news is not really surprising, and certainly not unnerving. It's understandable, and traders and investors can decide what they think it means and get on with their usual business. In contrast, a no-news event -- think of the Flash Crash, for example -- is very different. It is a real shock and presents a lingering unexplained mystery. It is unnerving and makes investors uneasy. The resulting uncertainty registers in high volatility. Our main result is indeed that most large jumps... are not related to any broadcasted news, even if we extend the notion of ‘news’ to a (possibly endogenous) collective market or sector jump. We find that the volatility pattern around jumps and around news is quite different, confirming that these are distinct market phenomena . We also provide direct evidence that large transaction volumes are not responsible for large price jumps, as also shown in . We conjecture that most price jumps are in fact due to endogenous liquidity micro-crises , induced by order flow fluctuations in a situation close to vanishing outstanding liquidity. Their suggestion in the final sentence is intriguing and may suggest the roots of a theory going far beyond the EMH. I've touched before on early work developing this theory, but there is much more to be said. In any event, however, data emerging from high-frequency markets backs up everything found before -- markets often make violent movements which have no link to news. Markets do not just respond to new information. Like the weather, they have a rich -- and as yet mostly unstudied -- internal dynamics. I just finished reading this wonderful short review of game theory (many thanks to ivansml for pointing this out to me) and its applications and limitations by Martin Shubik. It's a little old -- it appeared in the journal Complexity in 1998 -- but offers a very broad perspective which I think still holds today. Game theory in the pure sense generally views agents as coming to their strategies through rational calculation; this perspective has had huge influence in economics, especially in the context of relatively simple games with few players and not too many possible strategies. This part of game theory is well developed, although Shubik suggests there are probably many surprises left to learn. Where the article really comes alive, however, is in considering the limitations to this strictly rational approach in games of greater complexity. In physics, the problem of two rigid bodies in gravitational interaction can be solved exactly (ignoring radiation, of course), but you get generic chaos as soon as you have three bodies or more. The same is true, Shubik argues, in game theory. Extend the number of players above three and as the number of possible permutations of strategies proliferates it is no longer plausible to assume that agents act rationally. The decision problems become too complex. One might still try to search for optimal N player solutions as a guide to what might be possible, but the rational agent approach isn't likely to be profitable as a guide to the likely behaviour and dynamics in such complex games. I highly recommend Shubik's short article to anyone interested in game theory, and especially its application to real world problems where people (or other agents) really can't hope to act on the basis of rational calculation, but instead have to use heuristics, follow hunches, and learn adaptively as they go. Some of the points Shubik raises find perfect illustration in a recent study (I posted on it here) of typical dynamics in two-player games when the number of possible strategies gets large. Choose the structure of the games at random and the most likely outcome is a rich ongoing evolution of strategic behaviour which never settles down into any equilibrium. But these games do seem to show characteristic dynamical behaviour such as "punctuated equilibrium" -- long periods of relative quiescence which get broken apart sporadically by episodes of tumultuous change -- and clustered volatility -- the natural clustering together of periods of high variability. These qualitative aspects appear to be generic features of the non-equilibrium dynamics of complex games. Interesting that they show up generically in markets as well. When problems are too complex -- which is typically the case -- we try to learn and adapt rather than "solving" the problem in any sense. Our learning itself may also never settle down into any stable form, but continually change as we find something that works well for a time, and then suddenly find it fails and we need to learn again. A toothbrush does little but clean teeth. Alcohol is important mostly for making people more or less drunk. An automobile can take one reliably to a destination and back... There being so little to be said, much must be invented. Social distinction must be associated with a house... sexual fulfillment with a particular... automobile, social acceptance with... a mouthwash, etc. We live surrounded by a systematic appeal to a dream world which all mature, scientific reality would reject. We, quite literally, advertise our commitment to immaturity, mendacity and profound gullibility. It is the hallmark of our culture. And this was before color television. It's a key assertion of the Efficient Markets Hypothesis that markets move because of news and information. When new information becomes available, investors quickly respond by buying and selling to register their views on the implications of that information. This is obviously partially true -- new information, or what seems like information, does impact markets. Of course, this just one example and one can find further examples, hundreds every day. Information moves markets. Academics in finance have made careers by documenting this fact in so-called "event studies" -- looking at the consequences for stock prices of mergers, for example. But I'm not sure how widely it is appreciated that the Efficient Markets Hypothesis doesn't only say that information moves markets. It also requires that markets should ONLY move when new information becomes available. If rational investors have already taken all available information into account and settled on their portfolios, then there's no reason to change in the absence of new information. Is this true? The evidence -- and there is quite a lot of it -- suggests very strongly that it is not. Markets move all the time, and sometimes quite violently, even in the total absence of any new information. This is important because it suggests that markets have rich internal dynamics -- they move on their own without any need for external shocks. Theories which have been developed to model such dynamics give markets with realistic statistical fluctuations, including abrupt rallies or crashes. I'm going to explore some of these models in detail at some point, but I wanted first to explore a little of evidence which really does nail the case against the EMH as an adequate picture of markets "in efficient equilibrium." Anyone watching markets might guess that they fluctuate rather more strongly than any news or information could possibly explain. But research has made this case in quantitative terms as well, beginning with a famous paper by Robert Shiller back in 1981. If you believe the efficient markets idea, then the value of a stock ought to remain roughly equal to the present value of all the future dividends a stock owner can anticipate getting from it. Or, a little more technically, real stock prices should, in Shiller's words, "equal the present value of rationally expected or optimally forecasted future real dividends discounted by a constant real discount rate." Data he studied suggest this isn't close to being true. For example, the two figures below from his paper plot the real price P of the S&P Index (with the upward growth trend removed) and of the Dow Jones Index versus the actual discounted value P* of dividends those stocks later paid out. The solid lines for the real prices bounce up and down quite wildly while the "rational" prices based on dividends stay fairly smooth (dividends don't fluctuate so strongly, and calculating P* involves taking a moving average over many years, smoothing fluctuations even further). These figures show what has come to be known as "excess volatility" -- excess movement in markets over and above what you should expect on the basis of markets moving on information alone. Within this list, you find some events that seem to fit the EMH idea of information as the driving force. The market fell 6.62 percent on the day in 1955 on which Eisenhower had a heart attack. The outbreak of the Korean War knocked 5.38% off the market. But for many of the events the press struggled mightily to find any plausible causal news. When markets fell 6.73% on September 3, 1946, the press even admitted that there was "No basic reason for the assault on prices." Cutler and colleagues ultimately concluded that the arrival of news or information could only explain about one half of the actual observed variation in stock prices. In other words, the EMH leaves out of the picture something which is roughly of equal importance as investors' response to new information. Tick data on the S&P 500 futures contract and newswire searches are used to match events to large five minute stock price changes. 58 events that led to large stock price changes are identified between 1982 and 1999, 41 of which are directly or indirectly related to monetary policy. Many large five minute stock price changes have no events associated with them. All in all, not a lot of evidence supporting the EMH view on the exclusive role of information in driving markets. Admittedly, these studies all have a semi-qualitative character based on history, linear regressions and other fairly crude techniques. Still, they make a fairly convincing case. In the past few years, some physicists have taken this all a bit further using modern news feeds. More on that in the second part of this post. The conclusion doesn't change, however -- the markets appear to have a rich world of internal dynamics even in the absence of any new information arriving from outside. An Op-Ed I wrote for Bloomberg on high-frequency trading finally appeared today after a short delay due to a Bloomberg backlog. I meant for there to be a link in the article to further discussion here of some of the details of Andrew Haldane's argument, but that link is not yet in place at Bloomberg because of a mix up. It should be fixed later today. Meanwhile, for anyone visiting here from Bloomberg the further discussion I've given on Haldane's work can be found here. Economic theory relies very heavily on the notion of equilibrium. This is true in any model for competitive equilibrium -- exploring how exchange can in principle lead to an optimal allocation of resources -- or more generally in the context of game theory, which explores stable Nash equilibria in strategic games. One thing physicists find wholly unsatisfying about equilibrium in either case is economists' near total neglect of the crucial problem of whether the agents in such models might ever plausibly find an equilibrium. You can assume perfectly rational agents and prove the existence of an equilibrium, but this may be an irrelevant mathematical exercise. Realistic agents with finite reasoning powers might never be able to learn their way to such a solution. More likely, at least in many cases, is that less-than-perfectly rational agents, even if they're quite clever at learning, may never find their way to a neat Nash equilibrium solution, but instead go on changing and adapting and responding to one another in a way that leads to ongoing chaos. Naively, this would seem especially likely in any situation -- think financial markets, or any economy as a whole -- in which the number of possible strategies is enormous and it is simply impossible to "solve the problem" of what to do through perfect rational reflection (no one plays chess by working out the Nash equilibrium). Here we show that if the players use a standard approach to learning, for complicated games there is a large parameter regime in which one should expect complex dynamics. By this we mean that the players never converge to a fixed strategy. Instead their strategies continually vary as each player responds to past conditions and attempts to do better than the other players. The trajectories in the strategy space display high-dimensional chaos, suggesting that for most intents and purposes the behavior is essentially random, and the future evolution is inherently unpredictable. In other words, in games of sufficient complexity, the insights coming from equilibrium analyses just don't tell you much. If the agents learn in a plausible way, they never find any equilibrium at all, and the evolution of strategic behaviours simply carries on indefinitely. The system remains out of equilibrium. A little more detail. Their basic approach is to consider general two player games between, say, Alice and Bob. Let each of the two players have N possible strategies to choose from. The payoff matrices for any such game are NxN matrice (one for each player) giving the payoffs they get for each pair of strategies being played. The cute idea in this analysis is to choose the game randomly by selecting the elements of the payoff matrices for both Alice and Bob from a normal distribution centered on zero. The authors simply choose a game and simulate play as the two players learn through experience -- playing strategies from their repertoire of N possibilities more frequently if those strategies give good results. As the authors note, this kind of rich, complex, ongoing dynamics looks quite similar to what one sees in real systems such as financial markets (the time series above exhibits clustered volatility, as do market fluctuations). There are periods of relative calm punctured by bouts of extreme volatility. Yet there's nothing intervening here -- no "shocks" to the system -- which would create these changes. It all comes from perfectly natural internal dynamics. And this is in a game with N = 50 strategies. It seems likely things will only grow more chaotic and less likely to settle down if N is larger than 50, as in the real world, or if the number of players grows beyond two. Our results suggest that under many circumstances it is more useful to abandon the tools of classic game theory in favor of those of dynamical systems. It also suggests that many behaviors that have attracted considerable interest, such as clustered volatility in nancial markets, may simply be specific examples of a highly generic phenomenon, and should be expected to occur in a wide variety of different situations.